Provide a “Secret key”. It is used to authorize access to your NET API. Command line – all the options are available in command line mode. You can set up a Scheduled Task and synchronize your Active Directory with Brosix every day. NOTE: For securty reasons Brosix LDAP Sync tool does NOT export user passwords from your Active Directory. This means your users’ passwords for their Active Directory accounts are secured. This also means that your user accounts on Brosix will have different passwords. 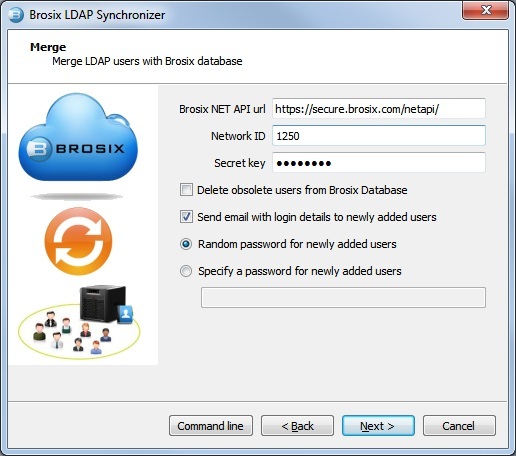 For your convenience, Brosix LDAP Sync tool can automatically create a password for every user account it creates and sends the user an e-mail with the Brosix account credentials. The user can change the password at any time. 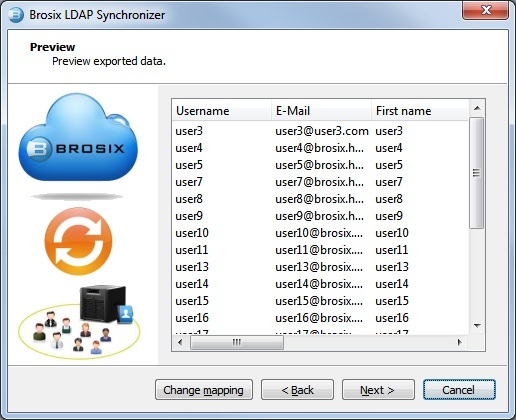 Brosix LDAP Sync Tool can synchronize all Active Directory accounts or only a group of users. 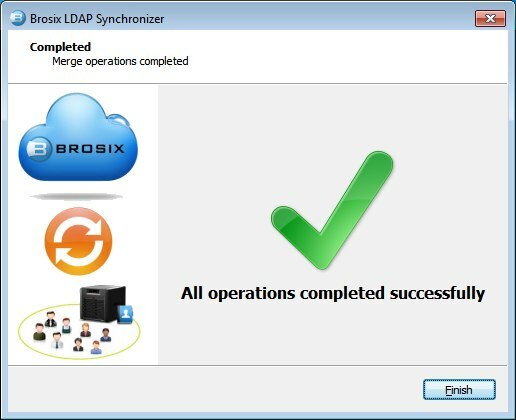 For example, you can put all Active Directory users that you want to use Brosix in a group “brosix” and make the LDAP Sync Tool synchronize this group only. 1. To make Brosix LDAP Sync Tool synchronize one or several groups, enter their names in the “Filter by groups” field. 2. To make Brosix LDAP Sync Tool synchronize all user accounts from the Active Directory, leave the “Filter by groups” field blank. If you check “Fetch disabled users”, accounts that are disabled in the Active Directory will also be synchronized with Brosix. You can review and change the mapping betwen the columns extracted from LDAP and the columns in Brosix. To do so click the “Change mapping” button. Click Next and provide your “network id” and “secret key”. If you check “Delete obsolete users”, all user accounts that exist in Brosix and are not existing in your Active Directory will be deleted from Brosix. Please, note, that deleted accounts will completely lose their data including their chat history. If you check “Send email to newly added users”, all user accounts that will be created in Brosix will receive e-mails with their account details: network number, account name, password and a link to download the application. This wizard prepares the command line parameters for the settings and options you have chosen. You can use these parameters to set up unattended synchronization. 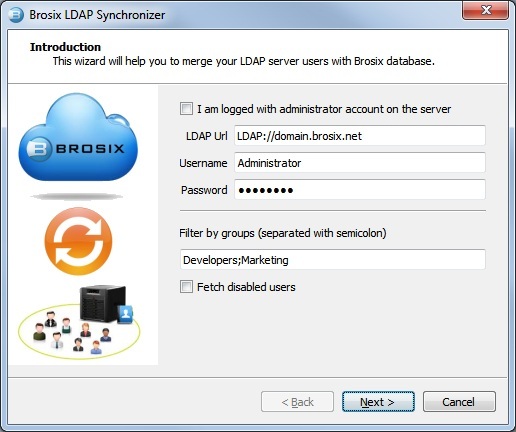 For example, you can create a a Windows Scheduled Task and synchronize your LDAP with Brosix every day. To get the parameters prepared by the wizard, click the “Command line” button. This will show all the available options. Now you can set up a Scheduled Task that executes BrosixLDAPSync.exe with the appropriate command line paramters. You can run the application in Standard mode to prepare the command line parameters and then copy them to your script, .BAT file or a Windows Scheduled Task.